SELF CATERING ACCOMMODATION IN LENASIA? HOLIDAY IN LENASIA? BUSINESS TRIPS, WEDDINGS, FAMILY FUNCTIONS OR MORE IN LENASIA? ACCOMMODATION NEAR TRADE ROUTE MALL, LENMED, NUR-Ul-ISLAM, SIGNET TERRACE, CLOSE TO SOWETO, CLOSE TO NASREC? OFFICE HOURS FOR NEW BOOKINGS AND ENQUIRIES ARE from 8am – 9pm. For Fast Service or Urgent Enquiries, Please Give Us Call on 083 343 2786. Welcome to Maryam’s Mansions – We take customer satisfaction seriously, so if you have any suggestions, drop us a sms or whatsapp +27833432786. 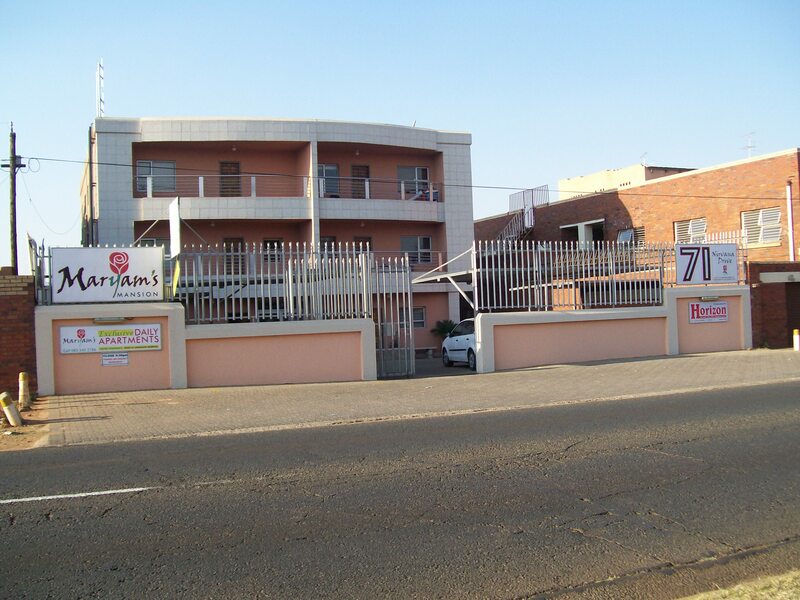 Maryam’s is Conveniently situated in Lenasia, close enough to all amenities, yet quiet enough to get a good night’s rest. Maryam’s Exclusive Daily Apartments is located on 71 Nirvana Drive East, Lenasia and can be accessed from the back entrance at 12017 Scarlett Crescent, Extension 13, Lenasia. Ideally suited for discerned families and business people traveling to Lenasia. Maryam’s Exclusive Daily Apartments is a self-catering establishment with a feeling of comfort, security, friendliness and a touch of home. Our establishment is frequented by satisfied clients from around the globe visiting their families, attending weddings, religious functions, business meetings and so much more. Apartments 2,3, 4, 11, 12, 13, 21 and 24 are equipped with basic kitchenware, dishes, pots, frying pan, cutlery, stove, fridge, microwave, etc. Apartment 22 has an undercounter fridge, kettle, cups, sugar, tea and coffee. All apartments have good quality beds, latex pillows, fresh linen and come with a starter pack of one set (2 bath towels, 1 hand towel) of towels and handwash when you check-in. Should you require more towels,or cleaning during your stay, Please /Call/Text us on 083 343 2786 to make arrangements beforehand and we will gladly accommodate you. We are close to Lenmed Clinic, Trade Route Mall, Signet Terrace Shopping Centre, Nur-ul-Islam, Baitun-Noor, Pentarosa Hall, Masjidus Saaliheen, Masjid Abdul Kadir Jilaani, Lenasia Cricket Stadium, Jamiatul Ulema, several fast food establishments, mosques, churches, temples, parks, etc. Should you arrive at night and require some last minute necessities, fear not.. Shoprite at Signet Terrace is open everyday of the year from 8am – 8pm. Pick n’ Pay Express can be found at Engen Garage at Freeway Plaza. Engen Quick Stop is available on Nirvana Drive as well. Pick n’ Pay at Trade Route Mall opens till 7pm most nights. Lenasia has a wide selection of Fast Food Outlets in the CBD, at Signet Terrace, at Trade Route Mall and various places in between. We don’t serve breakfast, but.. at Trade Route Mall you’ll find one to suit your fancy, why not try Panarotti’s hearty breakfast is very affordable and good value for money!, served until 11am daily – choose from breakfast on pizza or a more traditional breakfast (egg, 2 slices, macon, toast, 2 cheese grillers, tomato). Give us a call for bookings or drop an e-mail for non-urgent enquiries – a comfortable stay at rates you can afford. Don’t be shy, we’re serious about business, but easy to talk to and very accommodating – excuse the pun! All rooms have a musallah and some english kitaabs, Quraan. If you don’t find it in the room, it may be in the laundry or in use. Please notify us, if you require one. Our rooms are self-catering. For your convenience, we supply at arrival only: 1 set of towels (2 bath, 1 hand), 1 toilet roll, bodywash, handwash. All rooms have blankets, all beds have fresh linen, linen for sleeper couches can be found in the cupboard. If more are required, please give us a call. Rooms are only serviced for long stays or by prior arrangement at terms agreed upon. Most people are out all day, prefer privacy or are not avaailable. Because of this, we only clean by arrangement, call us a day ahead to let us know when you”l require us to tidy up. This way we won’t disturb you and you have time to secure your belongings. See our PRICELIST page for more rates, rules and banking details. Read them or right click, save as, to download. Click on apartment numbers to view each option. Explore the website for downloads, islamic info and local info.